​Sometimes it seems as if Colombia was designed for motorcycles. We have a great selection of adventure motorcycles that will get you around the country in perfect comfort and safety. and learn photography tips and techniques while exploring the most picturesque places that Colombia has to offer. ​Colombia is full of amazing places. From rolling green hills of the coffee region to remote mining towns in the colombian rainforest. We take you only to the best places to get amazing photos. We will cruise out of town in the coolness of the early morning, just as the city begins to wake, onto the highway east toward the resort town of Guatapé. About a 2 hour ride from Medellin, the colonial town of Guatapé sits on the shores of a crystal blue reservoir. Climb the nearby “El Peñon de Guatape” for an unforgettable 360-degree view of the landscape the is known as the “the top of the rock with the best view in the world.” We will then walk the streets of the town, snapping photos of the brightly colored houses. We will also have a chance to dine on fresh empanadas and drink ice cold cerveza michelada. Leaving Guatape we head to Rio Claro. Rio Claro means “Clear River” in Spanish, and as long as it’s not raining, the river lives up to its names with crystal clear waters. We can stroll the shaded paths through the rainforest as monkeys swing from the branches above and birds call from the treetops as well as explore the banks of the Rio Claro, investigating the natural caves, swimming areas, and countless species of plants and animals. We take a scenic off road route on our way to Honda, Tolima. Today we tackle the worlds longest road climb. Alto de Letras is a high mountain pass at an elevation of 3.679m (12,070ft) above the sea level, located in central Colombia. Located next to the Nevado de Ruiz stratovolcano, it’s said to be the longest road climb in the world.The climb starts at a sub-tropical 468 meters, in the town of Mariquita, and tops out at an arctic 3.679 meters. We end the day in the mountain town of Santa Rosa de Cabal. Today we wake up and go for a swim in then hot springs that are located nearby. The centerpiece of the hot springs is the nearly 100 foot tall waterfall that cascades down the rocks along the waters edge. Believe me, it's a really cool place. Afterwards we take a short drive to the south to Salento, a charming town in the Andes, known for its coffee culture and beautiful scenery. You’ll have the afternoon free to roam the city. Take a walk on Calle Real, Salento’s premier road full of local craft shops and vibrant colonial architecture painted in rainbow hues. Just a short drive away, you may also visit Cocora Valley where world's tallest palm trees look like the whimsical kind of plant you'd find in a Dr. Seuss story. Now, normally people say "Take a walk up to the lookout point and check out the beautiful scenery" but the hotel that I use for this trip is amazing and has a view of the area that is like being in heaven. So, you can skip walking up all the steps to the lookout point and instead, be served a great meal on the hotel balcony while taking in one of the most spectacular views ever. We will also get the chance to play the Colombian game of "Tejo" which consists of throwing rocks at exploding targets. We will spend the day exploring the Colombia’s coffee region. Our ride will take us through the mountains and into rolling green foothills with a visit to the strikingly beautiful Cocora Valley. Cocora Valley offers a lush ecosystem, lined with wax palm trees that shoot up to 60 meters high. Today we make our departure back to our home base in Medellin. Winding back through the mountains we will stop for lunch for a scenic lunch outside the town of Venecia. Price: $1600USD per person based on double occupancy, +$300 single occupancy + $900 for pillion passenger. ​Please note: There is a $1000 refundable security deposit. Deposits are held for 5 business days after the moto is brought back and are returned on the 6th business day. This allows us time to inspect the bike for any damages and allows time for any traffic violations infractions to be received. 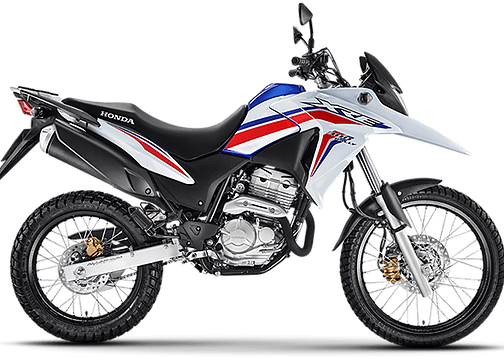 This lightweight, off-road capable adventure bike comes with a 300cc engine, electronic injection and long travel suspension. Possibly the absolute best motorcycle to rent in Colombia. The Versys-X 300: powerful enough go long distances, lightweight and fuel efficient and small enough to maneuver in traffic. 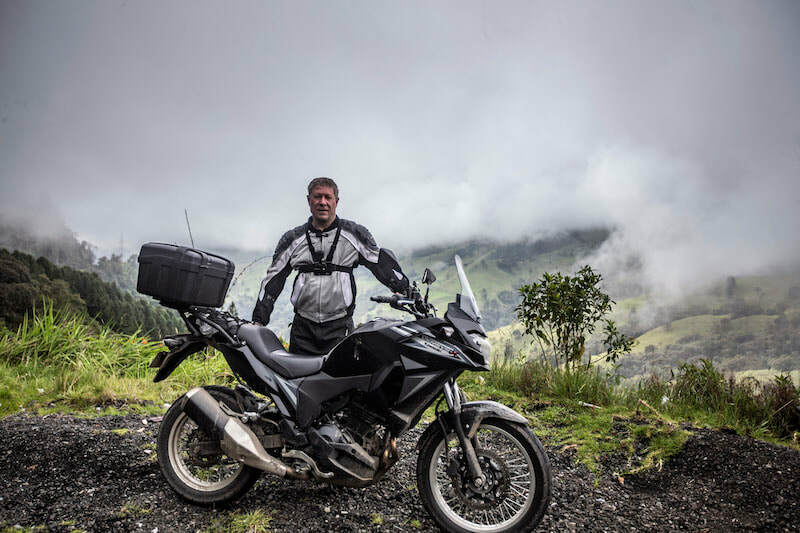 The Versys-X 300 is perfect for the twists and turns of the Colombian countryside. 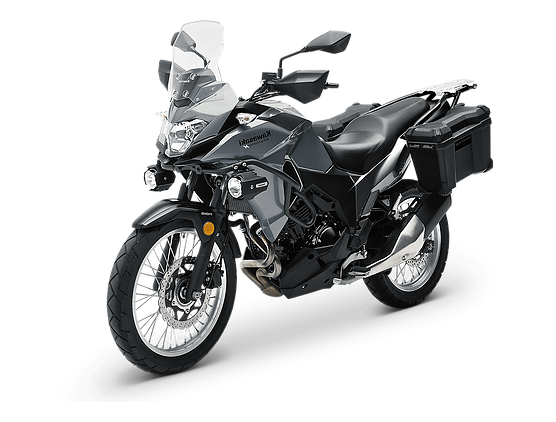 We use 2018 and 2019 Kawasaki Versys-X 300 and 2015-2017 Honda Tornado and XRE300 motorcycles. 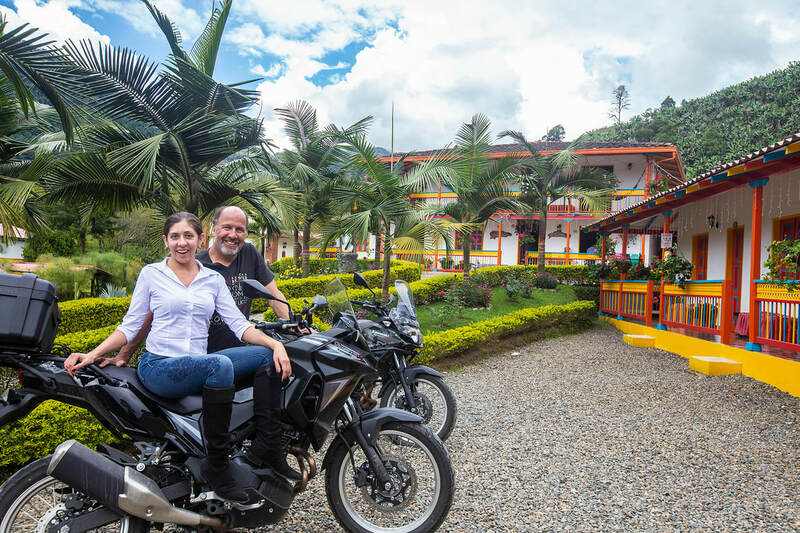 These are high quality medium sized motorcycles that are affordable and easy to handle while also being powerful and comfortable for long trips deep into the heart of Colombia. Colombia has some excellent paved roads but it also has lots of opportunity for off-roading. The Versys and Hondas are and entry-level adventure bikes and are perfect for people who are strangers to mud, rocks and river-crossings. They have soft power and are easy-to-ride which allows people to break into the adventure bike world, if not the complete round-the-world lifestyle while having enough power and features for veteran riders to enjoy as well. I’ve taken in into some very remote areas that might have been a little bit difficult for a heavier adventure bike. The 300cc motors are powerful for long distance trips and great for riding 2up and the ride height allows people to comfortably put their feet down when they come to a stop. Why take a motorcycle tour in Colombia? ​Time - This is the reason you buy produce from a supermarket instead of growing it yourself. The best time you can have on a trip is by riding on the best trails and roads instead of looking for them on your own. We know all the best roads trails and routes in Colombia. Know what you are getting into - Solo adventure can be a blast but a simple wrong turn can turn into something thats way over your head. Especially if you don’t know the language or the area. Maps are great but they are no substitute for a guide with recent experience on the trail. We base all our trips with what you are comfortable with doing. Friends - Instead of riding alone and assuming the risk that comes with that you can ride with a group of like minded adventurers. Taking a motorcycle trip with a group strangers is a surefire way to turn those friends into riding buddies. Local Perks - When you go to a new town where do you find the best food? Do you hit up the local restaurants or hang out at the national chain restaurants like all the other tourists? We know Colombia and know all the best places to eat and stay. We taylor trips to fit your budget and traveling style. Perks - Film services, repair services. Our tours have tool kits and first aid kits. We also know how to speak the local language and how to take care of things in case something goes wrong. Experience - After your tour you will feel much more comfortable in the area and be able to go back by yourself. You will find the best places to stay and eat and even be feel confident to start exploring trails on your own if you decide to come back again in the future. Value - You may actually save money. We can show you the best value for food and lodging as well as save money on equipment by using ours. 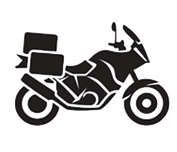 Instead of buying, transporting and hauling all your own gear, tool, first aid and snacks on your own motorcycle we take care of that for you. TL;DR: Theres nothing wrong with adventuring around and finding trails on your own if you have the time and resources. But riding with a tour will get you out on the best trails suited to your riding ability and ensure that your time is well spent. You will eat the best food and have the best accommodations for a solid value. You will ride lighter and safer with more confidence and a lot less stress about where to go and what to see. The best part is that you’ll probably meet some great new friends. Motorcycle luggage system, riding jackets, extra helmets and gloves are also available at a small extra cost. Our bike rentals come with 24 hour roadside assistance. If the bike breaks down on the road, just give us a call and we will handle it the quickest way possible to get you back on the road as soon as possible. These bikes are in great conditon but they are motorcycles and sometimes things happen that are out of everyones control. We do our best to handle the issue as fast as we can. Yes. All bikes come with SOAT (Colombias mandatory insurance) as well as full coverage motorcycle insurance that takes care of everything that SOAT doesnt. Personal medical insurance coverage is also included with all rentals. All the documentation needed in the case you get pulled over by the police or accident are on the motos at all times so you don't have to worry about a thing. The cost for damages are assessed within 3 working days after the bike is returned. You will receive all supporting documentation for damages. All our bikes have guards and protectors on them to limit any damage in the event of an accident. ​You need a credit card for the security deposit, passport, and drivers license and thats it! You're ready to go! Remember: All bikes require a $1000 security deposit. Deposits are held for 5 business days after the moto is brought back and are returned on the 6th business day. This allows us time to inspect the bike for any damages and allows time for any traffic violations infractures to be received. "My 2 week adventure trip to Colombia through Yacht Crew Travel Adventures was one of my best vacations - and I travel a LOT. The support right from the beginning to finish line was EXCELLENT. All my questions prior to the trip were answered satisfactory by Steve ; all participating trip members were looked well after and got all the help the needed. The activities booked for us were fantastic and the additional tour guides in between activities brightened our horizons on local culture. The hostels picked for our stay were beautiful and Brandon, our local contact, team leader and support is an outstanding, genuine individual, who was flexible and made things happen as we needed. 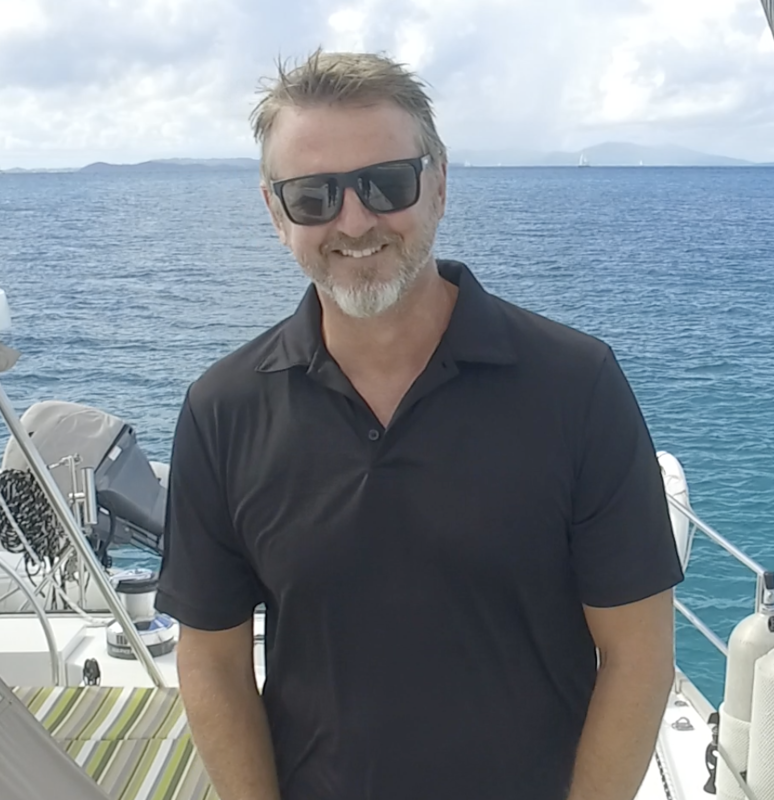 Would I consider another trip through Yacht Crew Travel Adventures: ANY TIME!"